Ermidra Foam for Cats and Dogs is made of an oat milk consistency. 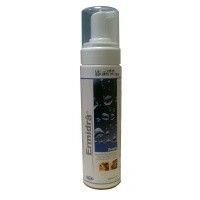 The rehydrating foam quickly and effectively refreshes without the need for water. Ermidra soothes skin conditions caused by itching and works rapidly and effectively, leaving fur silky and shiny. This oat milk foam is particularly suitable for washing puppies and kittens, convalescent animals, after medical interventions and in between baths. Instructions for use: shake the container and distribute the cleansing foam evenly over the animals coat. Rub against the direction of hair growth as required, to allow the product to penetrate deeper. Leave to work for a few minutes and then comb through. Composition: Oat milk, chlorhexidine digluconate, betaine, Isotridecanol ethoxylated, propylene glycol, fragrance, deionised water.